Available the catalogue in Acrobat pdf. Download last catalogue from this link "catalogue". 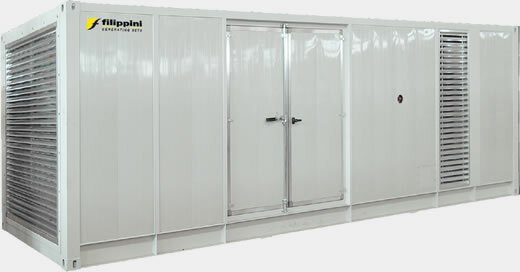 Filippini Gruppi Elettrogeni S.p.A. designs and manufactures generating sets up to 2000 kVA, both on open skid base frame and with soundproof canopies and / or containers, with manual, automatic or parallel operated panels. Special projects are handled by our technical staff, qualified in providing solutions to meet customer specific needs. We can supply a communications module, which allows access to the system remotely through mobile phone GSM or PC via cable / modem. 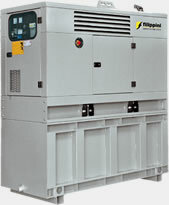 Filippini’s ATS (automatic load transfer switch) panels offer a compact response to power failures. Flexible, upgradeable available such as panels with multiple transfer switches for backup of various mains power supplies through one generating set. 20 kVA Gen Set in soundproof canopy with 1000 lt. tank. 5 per 570 kVA parallel operated Gen Sets. 1000 kVA Gen Set in container.